I’ve been planning to genre shelve for a while now. Last year I started the project of color coding books by genre. Over the summer and since the beginning of the school year, I finished up with the color coding. I ended up going back and breaking Mystery/Adventure into their own separate categories, which was definitely a good call. I have a volunteer grandmother who is GREAT! She’s a retired teacher and she’s willing to work on those monotonous tasks that I never seem to get around to doing. Last week she started going through and changing books in the catalog so we’ll actually be able to find and track books by genre. I’ve decided not to change the spine labels since they’re color coded and that makes for VERY easy shelving. I do want them changed in Destiny, though, so students will know which section to search. So instead of FIC COO for Caroline Cooney’s books, it will be F M COO to signify that it’s in the mystery section. She moved her classes to the library the next day (which was last Friday) and helped me stay sane and get things in place. We ROCKED it and everything is now arranged by color! SCORE! It was EXTREMELY dusty, so I used my handy pink and zebra print duster. This experience was not without its moments of overwhelming stress. 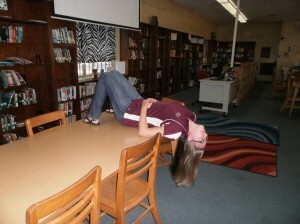 A teacher snapped this picture of me having a minor panic attack in the middle of my crazy move! In the end, though, it all worked out beautifully. BEAUTIFULLY! 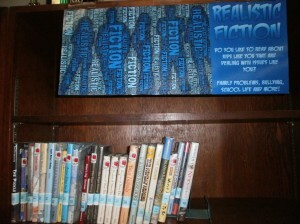 I even created these snazzy genre signs, which was an idea stolen from my pal Tamara Cox, who used Wordfoto to design her shelf signs as well. Check ’em out! I’ll be posting them on my Flickr account very soon so you can grab and use them if you’d like! So far, the students are LOVING this new arrangement! I think that it’s really going to enhance their browsing experience. I think it’s also going to help me tremendously with collection development — I’m already noticing what areas need more attention. So proud of you. I know it is hard to jump in and do something like this. Can’t wait to hear how the kids continue to love it. Oh man, little voice in my head, you need to stop telling me to do this now. I agree with Tamara, I can not wait to to add some excitement to my genre sections. Thank you for the ideas! The signs look great! 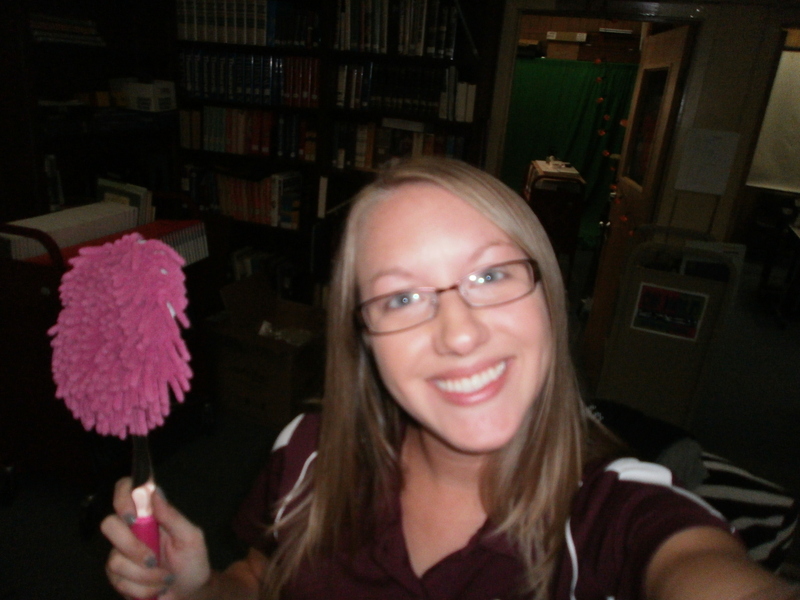 Hope that you and your students enjoy your new set-up! Love this. I’m thinking of doing this too, but find it so daunting. I love the idea of testing the waters first with the color coding. Thanks for posting. I love it! 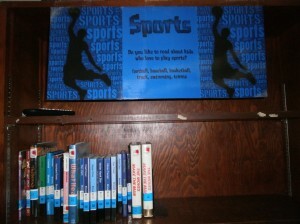 I am thinking about doing this in my elementary school library. I read your past post about when you started color coding your collection and was wondering did you end up coding the series? I was also wondering if you have a separate graphic novel section? Historical fiction did get its own section. And I’m thinking about integrating the series books back into their genres. 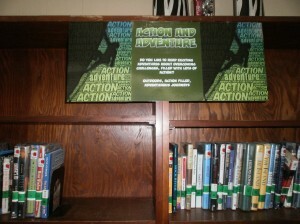 I do have a separate section for graphic novels as well! Thought I’d let you know that we decided to do the same thing this week. Started off in small pieces and focused on animals and mysteries. Made a wordfoto on the latter – will send it to you. I figure after 4 years I have enough evidence that it works, and in my 6th year as a librarian, I am no longer the new kid on the block. I like your posters! They are very cool! I am so thrilled that there are more of us out there throwing the tradtional system to the wind! I have been thinking about this for a while too and have done small amounts at my K-2 library. After the smack down and reading your entry I am going for it. I do have a great assistant that will do most of it. 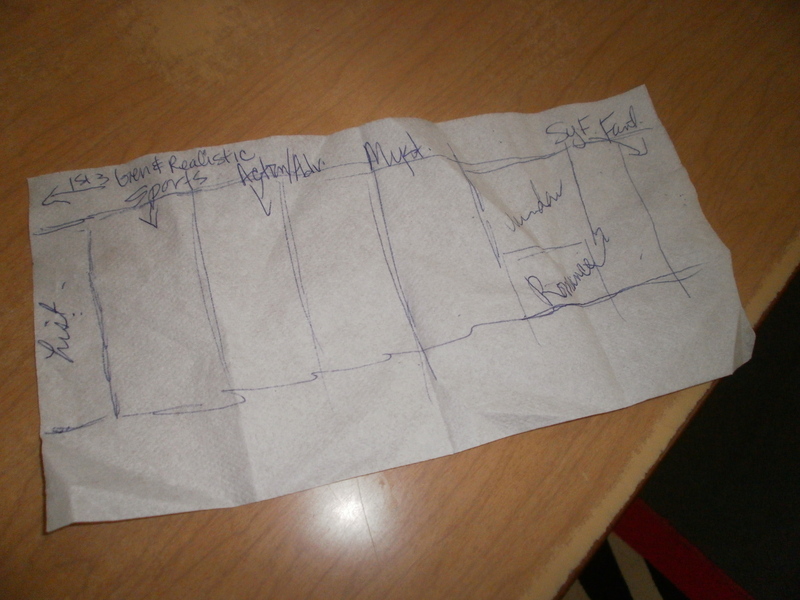 Can you tell me what all of your categories are? Why do you want to add series back in to their genre? My kids are great at finding what they want there. Are your paperbacks separate? Would you genre-ize those as well? I really just want to help my kids find great books. I have just packed up 20000 books, my fiction all color coded according to genre. Some of my books have two or three color codes. Eg. War and friendship/ relationships. How would you shelve them? 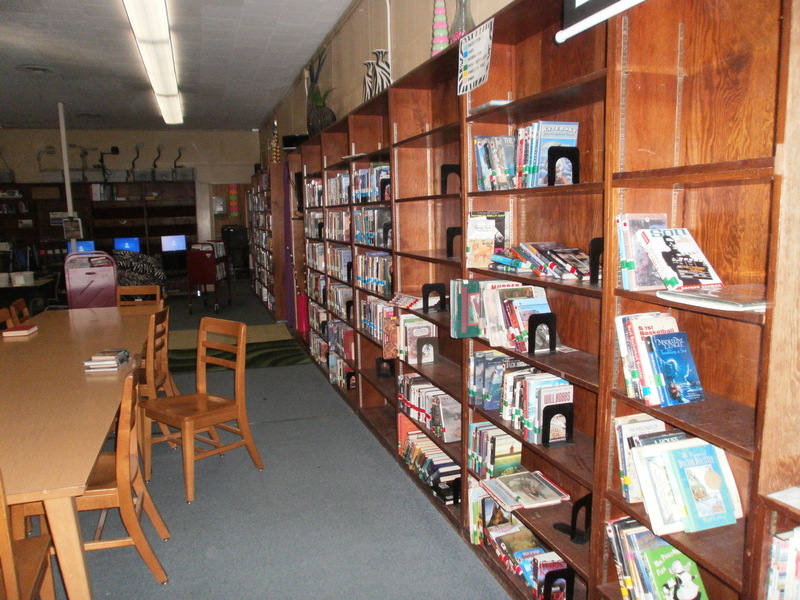 My library is divided into three fiction areas… Chapter books for the little ones, a junior section for the older kids, and a teen section. I love the idea of shelving according to genre. Yay, little girls and their magical fantasies could all be in one area. I started genre this semester… We are about ready to move books together… Right now they are just labeled… The kids are noticing the labels and looking for things by the label… Now, what to do with non fiction? My kids hate looking for books by Dewey, things get shelved wrong, misplaced, etc. I think I am going to pull titles from nonfiction that kids should read for pleasure and feed them into the fiction section. Crime and sports will be where I start. I love your signs. I have done this in two libraries, and we are in the midst of it in my 3rd. It is a lot of work, but the students love it so. I am inspired to update our signage. Thank you for the information. I’ve just inherited a wonderful mess. I am building a library from the ground up. Having plenty of materials, no inventory list, a partial classification scheme (Some books have call #s on them). After reading several posts, I’m planning on genrefying my collection. I really like the idea of stickers and am open to suggestions on the best grouping. Oh, I think I’ve just finished weeding my collection of all books pre 1975. Including a first edition Charlotte’s Web. I’m keeping most everything since then until I know my budgets and how much trauma I want to let loose. As a new school librarian, with 10 years of professional experience in other libraries, I am happy for any advice. Just curious what genres you used for the big switch? Everybody seems to have a slightly different idea as to genres to use. I was going to try and switch the entire library (F & NF) around at the same time, but I think I need to take baby steps. I’m going to start with F and move my way into NF. You’re the best! Thanks for sharing the genre art on Flickr. I’ve added some non-fiction tags that have a similar “feel”, and created spine labels to match. The library is looking awesome, thank you so much for sharing! Your post encouraged me to make the genre plunge. It took me 2 1/2 months to relabel my fiction but it was worth it! I color coded the books, added new spine labels, new 3×12 mini posters (to attach to plastic magazine holders on the shelves), and changed everything in my Destiny catalog. I now have adventure, fantasy, historical, horror, humor, mystery, realistic, science fiction and traditional genres. Plus, I kept my series shelf and just added a special color for those books. My school is K-6, and so far the students are embracing the change. Older titles are being circulated once again. Thank you Tiffany, and everyone else who promoted this idea. 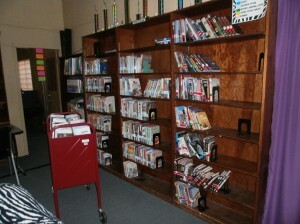 After seeing my success, another librarian in my district is going to switch to genre shelving too. I’m pretty excited about the whole thing! Here is the Prezi I used to introduce the idea to my 3-6 graders. this looks great my Librarian is trying to do the same thing any ideas where she might begin on hers? 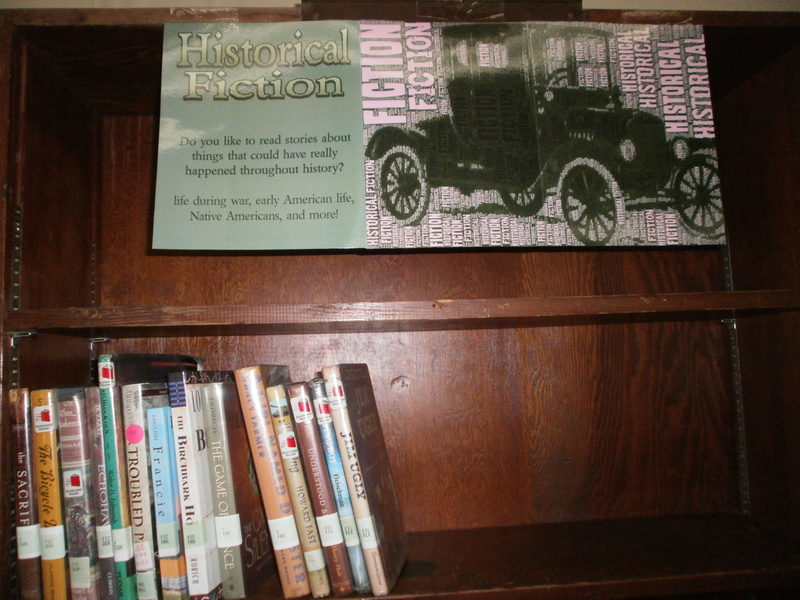 With the help of a retired librarian looking to volunteer, we have embarked on genre shelving fiction in our library, beginning with fiction. 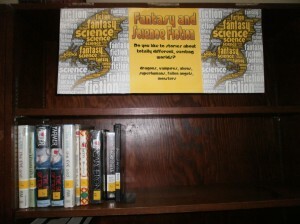 I like your idea of grouping horror/mystery and suspense, also grouping sci-fi and fantasy. These groups helped simplify the process. One question into which group do you put all of the dystopia? I have started “genre-fying” at my high school library as well. (Since this is my first year as a librarian, sometimes I think I am nuts but…. well… there is no “but” — I am nuts!) There is a reason that bookstores use this model… they sell more books! I love your signs. Did you use a particular program to make them? I used an app called WordFoto to create the signs that look like word clouds. I used clip art from OpenClipArt.org for others. Can you tell me if you make your signs or did you purchase them? I love them and I have been looking for something. I am a student teacher and my big project was to divide all the YA books into genre bins. It’s all done now, and feedback from students has been positive. I’m curious to know how your genre-shelving organization has worked out in the long term. Several years after genrefying our library collection, I still feel like it’s one of the best things I’ve done for our library! 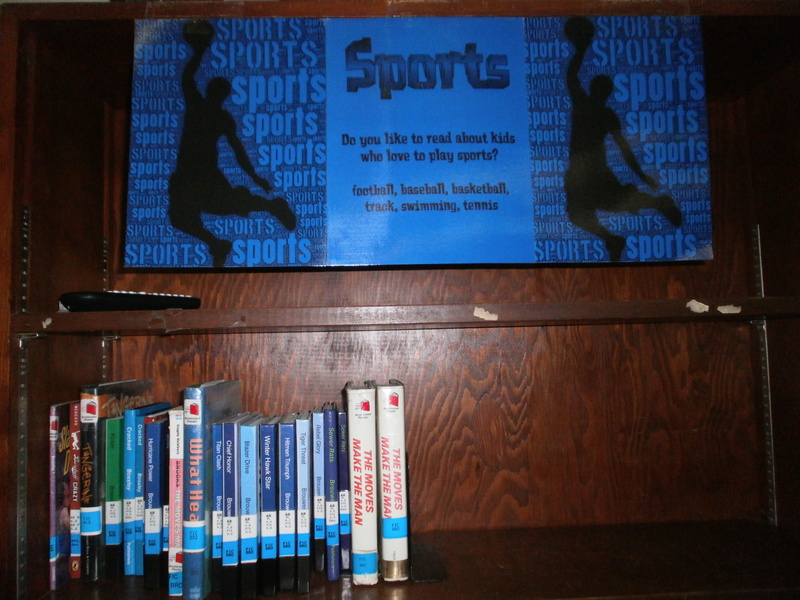 The students love it and understand the way our books are arranged…it just makes sense! It also helps me easily “see” what’s available and being checked out the most to better develop and grow the collection. I’m glad to hear this is still going well for you and your students. What did you ever decide to do with the Non-Fiction books? I attended all of your sessions at AAIM this weekend and I am so excited to get back to school and get started on my collection. I have been thinking about shelving by genre for a while but did not have the confidence to take the first step. After hearing you speak and reading your blog, I’m ready! Thanks for all of the information and motivation! 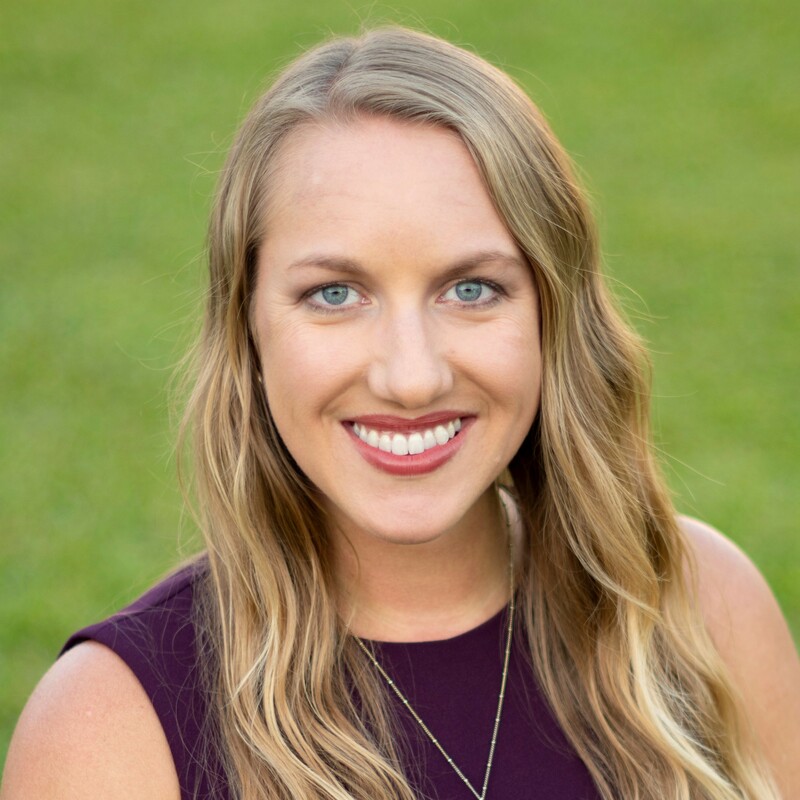 Janna, thanks so much for attending my sessions! I’m so glad you were able to get some quality information and ideas from them. Please let me know if you have any questions as you get started with the genrefication process! I love your genre signs, but I wasn’t able to find them on your Flickr page. Do you still have them up? Do you feel that this system would work in an elementary library? I love it and would like to try it, but I’m unsure of its setup with the much younger crowd. 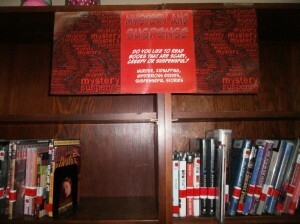 Could I possibly use your genre signs at my middle school library? I love them! I love your genre signs. 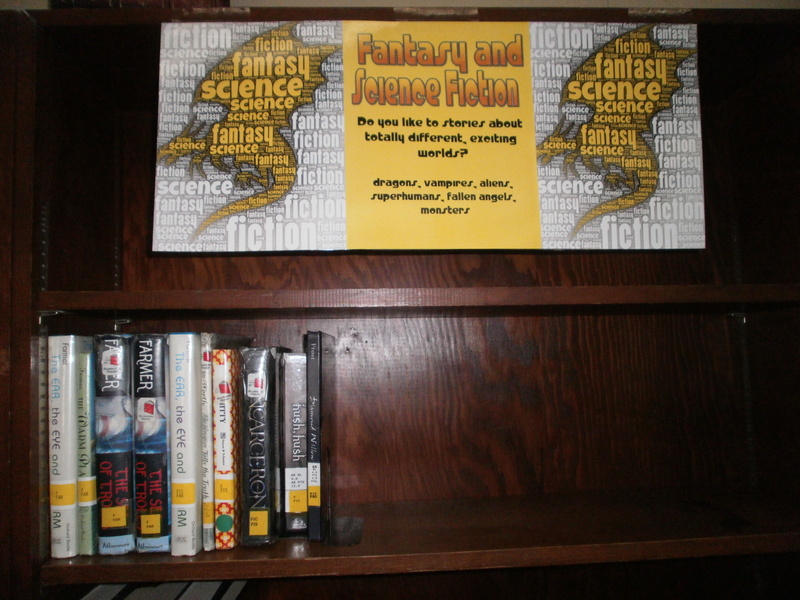 Could I possibly use your genre signs at my high school library? Organizing by genre is a life saver. We started this process about 2 years in our library and it has made life easier fro staff. students and me the TL! I have genre stickers that the kids learn to identify in their September library lessons and I am working on trying to ensure all fiction titles in Destiny reflect their genre………MYST F LAW or DYST F COL. I’ve kept the genre abbreviations to 4 letters max after much reflection. I am now venturing forth into the world of binning my non-fiction. Thanks for your informative post! Love your genre signs. Thank you for allowing their use from Flickr. 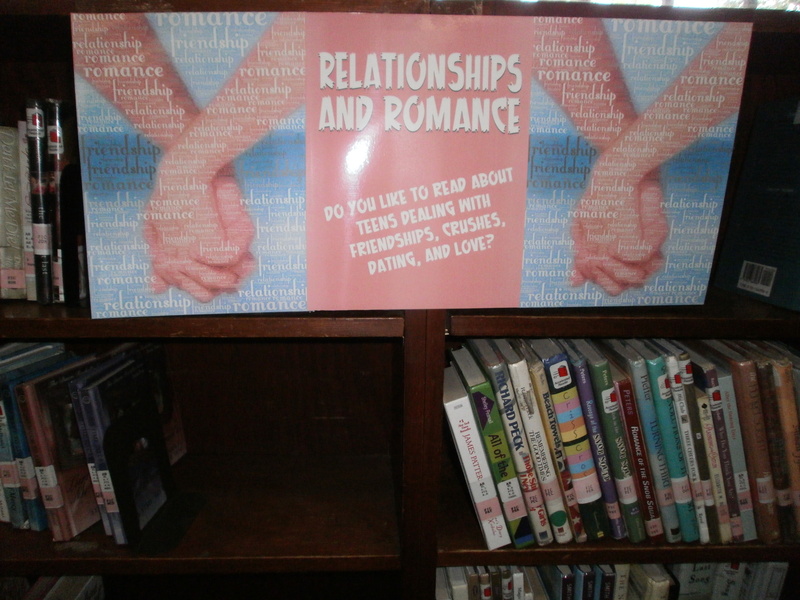 How did you make the signs that you show in library? Are they posters? Framed? I want to do them like you did. Give me some info please.